Back in the day, the creative guru of bebop, Charlie Parker, yearned to play with a string ensemble, seeking a kind of classical blessing on his creative genius. He had already made his mark in many ways. 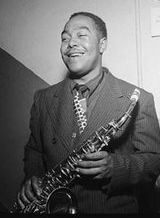 An instance: when Parker spotted the composer Igor Stravinski at a table in the club where he was playing, the saxophonist worked opening phrases from Stravinski's "Firebird Suite" into his improvised solo. The composer became so excited that he upset his drink on his companions. But Bird wanted strings. A recording date was set in late 1949, resulting in two still famous albums, with a jazz rhythm section and a classical string ensemble. Produced by Norman Grantz and issued on 78 rpm records by Mercury, the sides became Parker's most popular recordings during his lifetime -- Bird soaring over the lush string sounds. Now, 66 years later, the original string arrangements, a mix of standards and originals, have been reclaimed and are being brought to life again by a string ensemble of students from NYU Fredonia, with braitone saxophone great Bruce Johnstone -- one of the few musicians around not to make audiences wince at the comparison -- filling the role of Bird. 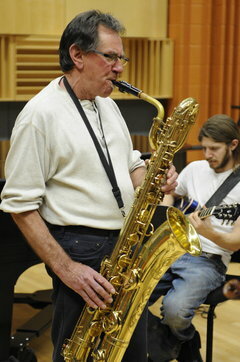 Blasco, its interest and resources in jazz music expanded by journalist Bob Protzman's gift last year of his extensive collection of jazz records and memorabilia, is eager to display its jazz chops and expand its visibility as a center for regional jazz scholarship and musical interest.